Larger Rolls reduce your shipping, handling and warehousing costs. Purchasing larger paper rolls means a reduction in your shipping and handling because you have to order less often. Less roll changes and register downtime save valuable time and money. Changing rolls less frequently equates to lower personnel costs and an increase in customer satisfaction. The time you save can be better spent servicing customers! Larger rolls offer a lower cost per foot of paper. 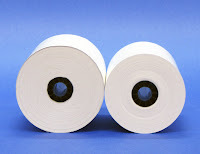 While there is a higher up front cost, the larger paper roll is actually less expensive and lasts longer. Our paper roll products are designed to deliver high performance and compatibility in all common transaction printers while minimizing the user's total cost of ownership. Our paper rolls are used in a wide range of applications including Point-of-Sale, Cash Register, Credit Card Terminal, Kiosk, Fax, Pay-at-the-Pump, Medical, Casino/Gaming, Self-Check-out, Mobile Printers and many others.